Outstanding BGS Senior working toward education in order to serve others. 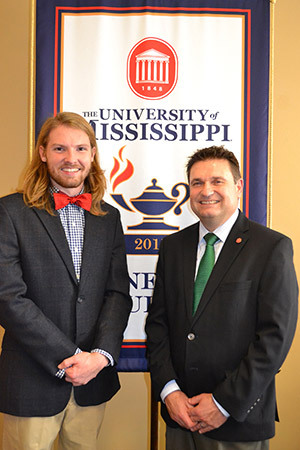 OXFORD, Miss.­­­ – UM Senior Connor Edwards is from the small town of Pickens, Miss. in Holmes County. Even though he is from a more rural area of the state, he has his sights set on some big world experiences and has set his future in motion with the goal of helping people on the other side of the world. A transfer student from Holmes Community College, Edwards has excelled during his time at UM. He was recently named the 2016 Outstanding Senior in the Bachelor’s of General Studies (BGS) degree program as well as the class marshall. He will deliver an address during the UM graduation ceremonies scheduled for May 14 on the Oxford campus. “I knew Connor was a remarkable young man when I began recruiting him to transfer to Ole Miss,” UM Development Officer and former community college admissions counselor, Jason McCormick said. Edwards earned the prestigious Lyceum Scholarship when he transferred from Holmes Community College to begin his junior year on the Oxford campus in the fall of 2014. When he first came to Oxford he was considering a career in the medical profession, but a summer trip to Thailand changed his mind. Edwards changed his major to a specialized BGS degree. The BGS program at UM is a cross-disciplinary degree plan offered to maximize opportunities for individuals that want to reach personal goals, meet job requirements, and advance their careers. Students can choose any three minors offered at the University and create a specialized educational path. “By changing my major, I was able to study things I was interested in like language and philosophy,” Edwards said. Edwards’ degree is comprised of minors in biology, chemistry and religion. The travel bug had bitten and in the summer of 2015 Edwards headed back overseas again to teach English to college students in Japan. When he returned he helped start the “Global Café” on the Oxford campus to give international students on the UM campus an opportunity to meet and foster friendships with American students. When Edwards returned to Oxford following his Japan visit this past fall, his learning didn’t stop. He dove into a strenuous senior year of courses and continued to achieve. His hard work paid off as he was selected to receive membership in the prestigious academic honor society Phi Kappa Phi in November. “The significance of this honor is that it recognizes Connor’s school and service work as being at the highest level for a college student,” UM Dean of General Studies Tony Ammeter said. Upon graduation in May, Edwards plans to pursue his Master’s degree in Teaching English as a Second Language (TESL). McCormick says he has stayed in touch with Edwards upon his arrival to the Oxford campus and has been especially proud of his work with international students studying on the UM campus.